When you are a small not-for-profit, developing a long-term relationship with the right web professional can be key to developing and applying an effective online promotion and outreach strategy.. 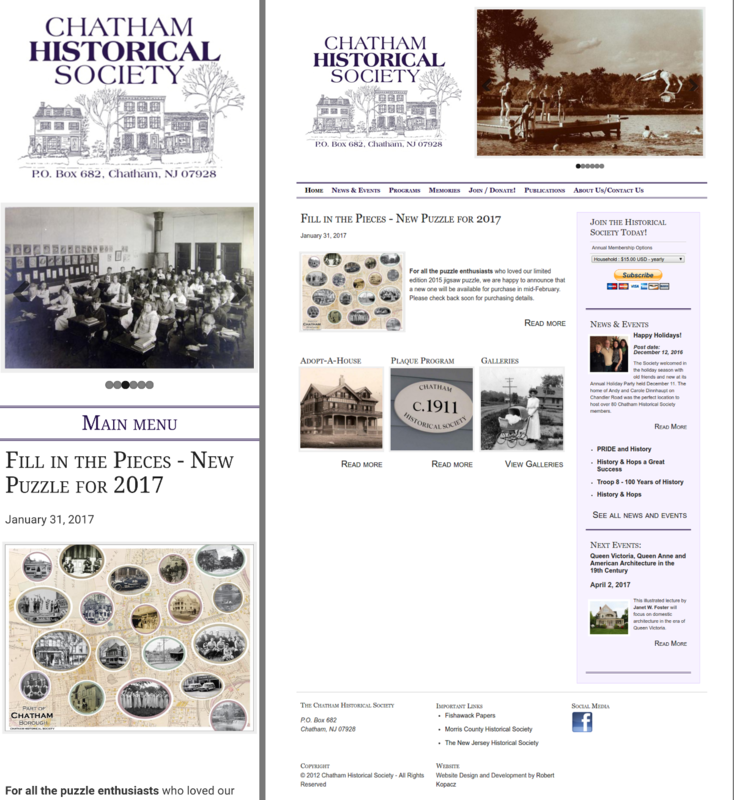 I started working with the Chatham, NJ Historical Society in late 2011. I built their site in Drupal 6. When Drupal 8 development started getting hot, I recommended that they upgrade to Drupal 7 (once Drupal 8 was released, Drupal 6 security monitoring support would end, causing a potential for security risk). That upgrade happened at the end of 2013. Although at that time, responsive web design (which was the latest and most economical technology for making a website "mobile friendly") was available, the Society did not want to spend the extra money for that feature just yet. So, when I upgraded their site to Drupal 7, I used Adaptivetheme, a theme framework with lots of nifty features and options that helped streamline the redevelopment process. It also has an option to implement a framework for responsive web design, but that option can be turned off. So when upgrading the site, I just turned the responsive feature off. At the beginning of this year, they notified me that they were ready to go "mobile friendly." Thanks to the advance planning with Adaptivetheme during the Drupal 7 upgrade, we were able get the site mobile friendly in a week and a half. Adaptivetheme has been designed to work well with such great page management and layout tools like Page Manager (a part of the Chaos Tools Suite module), and Panels. This permits the Society to mange sidebar content per page in an intuitive and user-friendly fashion, giving each sidebar greater relevance for any given page on the site. Additional tools like Metatag and AddtoAny, added along the way, provide the necessary infrastructure to optimize the site for search engines, and also optimize sharing site pages on social media platforms like Facebook, thanks to Metatag's submodule for integrating Open Graph tags. So what does all this add up to for the Society? A solid, self-hosted platform for local outreach and promotion of their events, leading to increased membership, event participation, and donations for years into the future. Interested in a website for your organization? Click here to contact me. Want to learn more about what's involved in getting your own self-hosted website? You should buy and read my book.